Americans are used to having BlackBerrys glued to their hands, but after Oct. 11, travelers who fly to the United Arab Emirates will have to check their precious data service at the border. The UAE's telecommunications regulator announced Aug. 1 that because of security concerns, visitors and the some half-million local subscribers will have to learn to live without BlackBerry messaging, e-mail and Internet. The Emirates, and other countries such as India and Kuwait, have long battled with Research in Motion, the Canadian company that makes the BlackBerry, over the device's encryption, which makes it virtually impossible for governments to monitor the content for politically or morally objectionable material. The UAE's bold all-out ban, which may hurt the country's business and tourism aspirations, was criticized by State Department assistant secretary P. J. Crowley. "It is our view that you should be opening up societies to these new technologies that have the opportunity to empower people," he said. "We think it sets a dangerous precedent." 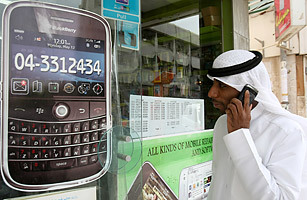 Two days after the UAE's announcement, Saudi Arabia announced it would halt BlackBerry service by the week's end.